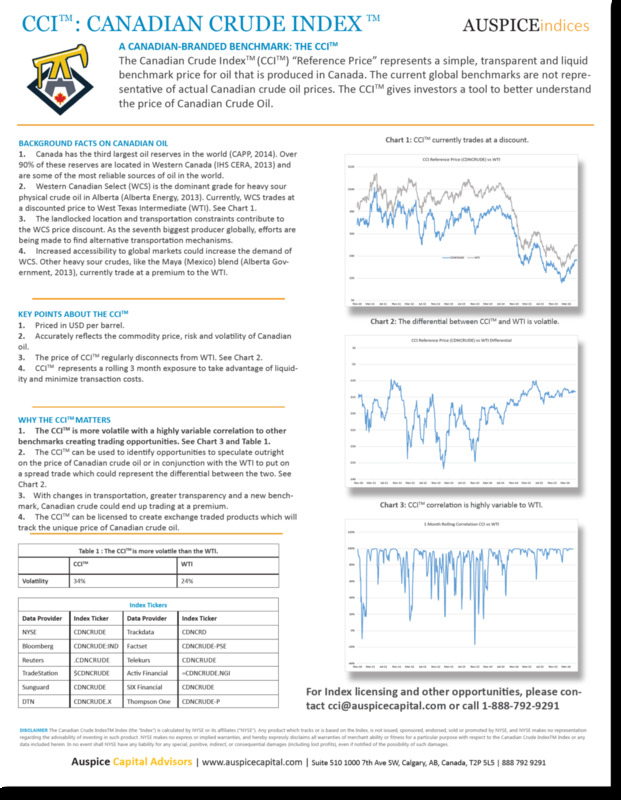 CCI™ represents a simple, transparent and liquid fixed price benchmark for heavy-sour oil, referred to as Western Canadian Select (WCS), that is produced in Canada. The CCI is priced in USD and is calculated as the sum of WTI price and the WCS differential price (WCS currently trades at a discount to WTI). The CCI Reference Price (CDNCRUDE) and the CCI Excess Return Index (CCIER) are based on a rolling 3 month weighted average of WTI and WCS prices based on the weights in the table below. * The WCS price is the mid-market price of the ICE TDX futures contracts at 14:30 ET. The CCI Excess Return Index is the benchmark for the CCX ETF, the only publicly traded product with direct exposure to Canadian WCS Oil. It accurately reflects the commodity price, risk and volatility of heavy-sour Canadian oil. CCI™ represents a rolling 3 month exposure to take advantage of liquidity and minimize transaction costs (see Weightings and Index Calculation Historical Data).